Syrian rebels’ claims that they attacked President Bashar al-Assad’s convoy have been denied today by the information minister. Reports that rebel rockets hit his motorcade were “dreams and illusions”, Omran Zoabi told Syrian state TV. Rebels said they fired mortars at his convoy as it headed towards the Anas bin Malek mosque in the Malki area, where the president has a residence. 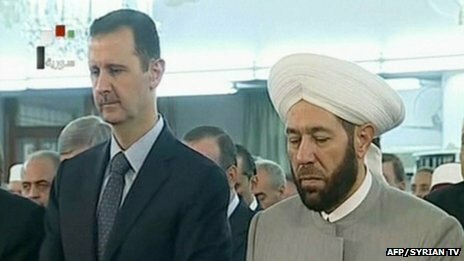 Pictures showed Bashar al-Assad unharmed at a prayer service at a Damascus mosque to mark the end of Ramadan. Earlier, Islam Alloush of the militant Liwa al-Islam Brigade, told Reuters news agency that rebel rockets hit the president’s motorcade as it drove to the mosque in the Syrian capital. Other activists reported rockets were fired into the same part of the city. It was unclear whether the pictures of the president aired on Syrian state television were pre-recorded. For a brief moment they carried a “live” caption, which then swiftly vanished. It is possible that the footage was pre-recorded, analysts said, as the reports that the president’s convoy was struck while travelling to the mosque had come around one hour previously. All roads leading to al-Rawdha neighborhood of Damascus, where the presidential office is, were closed for security reasons before the incident, Syrian opposition sources told the pan-Arab Saudi-owned Dubai-based al-Arabiya television station. Firas al-Bitar, a rebel leader, told al-Arabiya that 17 mortars had targeted the presidential convoy. The opposition had been given advance information on Bashar al-Assad’s movements, he asserted. But another of the president’s opponents, Wahid Sagar, told Al Arabiya the president might have been in a different convoy to one which reportedly came under attack. On Wednesday, Syrian government forces claimed to have killed more than 60 rebels in an ambush near Damascus. Military sources quoted by the state news agency Sana said the victims were insurgents in the jihadist group, al-Nusra Front. They had been planning an attack on a military post, they said. The news came as rights group Amnesty International released satellite images of Aleppo, one of Syria’s biggest cities, showing how clashes between government and rebel forces had devastated built-up areas.